Aquatec Cleaning Group cover Central Scotland and Ayrshire, offering top quality professional carpet, rug and upholstery cleaning services. Why You Should Hire A Local Carpet Cleaning Company? In this, “do it yourself” world, there are still certain things you should simply leave to the professionals. Carpet cleaning is one such service. Your alternative to hiring someone that does this for a living is the back breaking and time consuming alternative to do it yourself. Perhaps you have a friend or handyman who claims to be able to clean carpets but what if he doesn’t have the skill or know how it takes to do the job well and safely? Your home is your castle. It’s your sanctuary. Your carpets hold dirt, mould and sometimes food particles, pet urine or even fleas and mites. 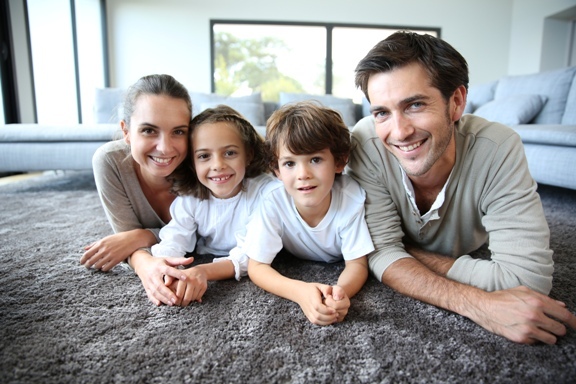 Your carpets should be a clean, safe, surface where your children are able to sit and play or watch television. It’s imperative to keep your carpets clean and only a true professional can do the job right. What are some of the differences in having your carpets cleaned by a professional? The equipment a top notch professional uses can’t be compared to the kind of machines you can rent or buy for home use. The machines you can rent are really just high powered, glorified vacuum cleaners. Yes, they have more sucking power than the average vacuum and you use hot water and special chemicals to clean your carpet with these kinds of machines, but they don’t compare to a professional level portable or a truck mounted system used by a carpet cleaning company that takes their work seriously. The power of a professional portable or the truck mount system means knowing that the hardest to reach, deepest, ground in dirt, will be pulled from your carpets along with the water that is required to clean them. Also, both systems use a much hotter water temperature than the machines available to the layman. Hotter water means cleaner carpets. “But it’s expensive to hire professionals!” Not in the long run. By the time you rent the equipment, drag it from the store, to the car, to your home, buy the chemicals that are available to you, which are probably not as powerful or long lasting as the chemicals used by a professional, you’re not saving a ton of money. And don’t forget that time is money. Your time is valuable. Is it worth it to spend an entire Saturday or perhaps a whole weekend cleaning carpets rather than enjoying time with your family, working on a beloved hobby, or enjoying outdoor activities? Arguably, if you plan to clean your carpets more than once a year, it may be cost effective to buy a top rated, steam cleaner for the home. But the time, effort and back breaking work may not be worth the trade-off of having your carpets cleaned once every 12 to 18 months as typically recommended. The professional technicians that work with this equipment are trained, certified and insured. That means they know how to get your carpets cleaned without ruining them or leaving you with days of damp, wet carpets that are subject to mould and mildew. These home use machines can’t get the water out of the carpet in the same way. It takes high quality equipment and knowledgeable, well trained experts to do the job correctly. Let’s consider some of the most important things you need to know about using a professional carpet cleaning service. There are factors in drying carpets. How deep the carpet pile is, what the ambient humidity is outside and inside the home, and the kind of equipment or service that is used are all factors. The largely preferred, professional, carpet cleaning method is the truck mount system. Typically, your carpets will be dry in 4 to 6 hours using this method. If the weather is not cooperative or the carpet pile too deep, special fans can be used for the sole purpose of expediting the drying process. Ceiling fans can also be helpful. Regardless, it’s not recommended that, where possible, you walk on the carpets for up to 8 hours after a professional cleaning. Give the carpet ample time to dry. Do I have to vacuum before carpet cleaning? Not really. A light vacuuming can be useful but not necessary when using a professional service. The rugs are being vacuumed during the entire cleaning process and the deepest dirt is removed while the carpets are being steamed with hot water and powerful cleaning agents. If you have excessive dirt, sand or pet hair, you may want to run a vacuum over the worst areas before the cleaning service arrives but otherwise the pros have you covered. Rooms vary in size and carpet pile is a factor but a professional carpet cleaning service can clean the carpets in a typical room in 20 to 30 minutes. The carpets in an entire home can typically be cleaned in 2 to 3 hours, start to finish. They will bring in at least one or more highly trained technicians who have this down to a science. If there are difficult, hard to remove stains, this can be a time consumer but the technicians will do their best to get even those nasty, hard to tackle stains out even if it means taking more time and effort to do so. How do I prepare for professional carpet cleaning? Remove small, easy to move, items from the room, especially your more valuable things. Plants, lamps and small, light, items can be removed but the cleaning crew will do the heavy lifting as needed. Once the carpets are cleaned, they put your room back in order and use protective padding if needed. If you plan to hire someone to clean your carpets, choose wisely. Check reviews from people who have used some of the local service providers and ask questions. Find out if they are certified and insured and always seek companies that choose eco-friendly, safe products for your home or office.